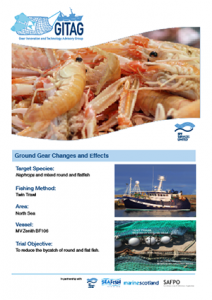 The Gear Innovation and Technology Advisory Group (GITAG) seeks to build on the body of work around gear selectivity, catch and discards reducing devices. 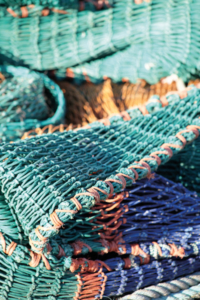 The Group was formed in 2015 when the Scottish Fishermen’s Federation’s wholly owned subsidiary company SFF Services had secured funding from the Scottish Government and European Maritime and Fisheries Fund to develop and trial innovative fishing gear exploring practical solutions aimed at reducing the amount of discards. One of the difficult aspects of managing a commercial fishery, which targets a wild population, is that you don’t know exactly what species will be caught. In mixed fisheries of this sort, discarding, or high grading, can be an issue. The stock would be larger and the fishery more productive if selectivity was improved in order to safeguard juveniles and minimize unwanted catches. There has been a substantial amount of work undertaken historically to develop and test innovative and more selective fishing gears. 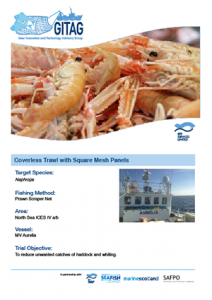 Marine Scotland Science, Seafish and other bodies have all assisted to develop selective devices and test the effectiveness of each one. To recap, Phase I delivered four projects; three of which went to full charter and one which was essentially a development project. 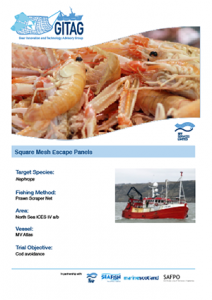 Summary factsheets for three of the trials are available below. The detailed reports will be made available in due course. It should be noted that many of the trials which have been undertaken have focused on the Cod Recovery Programme and therefore concentrated on the non-capture of cod, although there is some limited data on other species. We now seek to encourage skippers and fishers from all sectors to put forward innovative ideas for more selective gears which will help their targeted fishery become more sustainable. 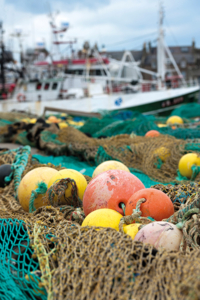 GITAG aims to address these research and development gaps by working with key partners including industry, Marine Scotland Policy, Marine Scotland Science, Producer Organisations’ and Seafish to promote and encourage innovation from the fishing industry as a whole. To recap, Phase I delivered four projects, three of which went to full charter and one which was essentially a development project. The reports for these trials will be available as both summary sheets as well as the more detailed reports. Phase II of the GITAG project is open to all Scottish vessels and its’ main objective is to look at individual business needs to ensure that the landing obligation can be met as it stands at the moment. We are looking to bring forward innovative projects which, when developed, suit specific business needs but may also have relevance to the wider fleet. 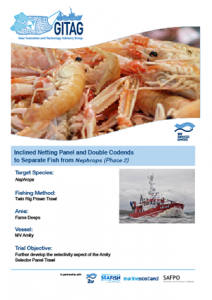 GITAG Phase II runs to December 2019 giving the industry a great opportunity to use the funds available to bring about innovation within the Scottish fishery. How do I contact GITAG? The project will be assessed by an Advisory Board of industry representatives and the Project Management Group. Feedback to the applicant will be given at each stage. 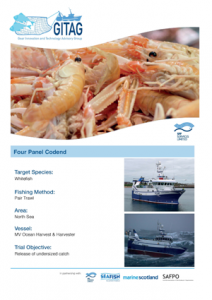 This project is supported by the Scottish Government and European Maritime and Fisheries Fund.